By popular demand, I made my ‘Pad Thai’ recipe last night. As a disclaimer, this is nothing like traditional Pad Thai. My husband likes me to call it that, so I’ll do it once for him! Really this is more accurately called “Loosely Asian-Inspired Vegetable ‘Noodles’”. Pad Thai-ish is easier to say though, right? This is a meal I make fairly often, because it is easy to vary depending on what vegetables you have on hand, and it’s a family favorite. 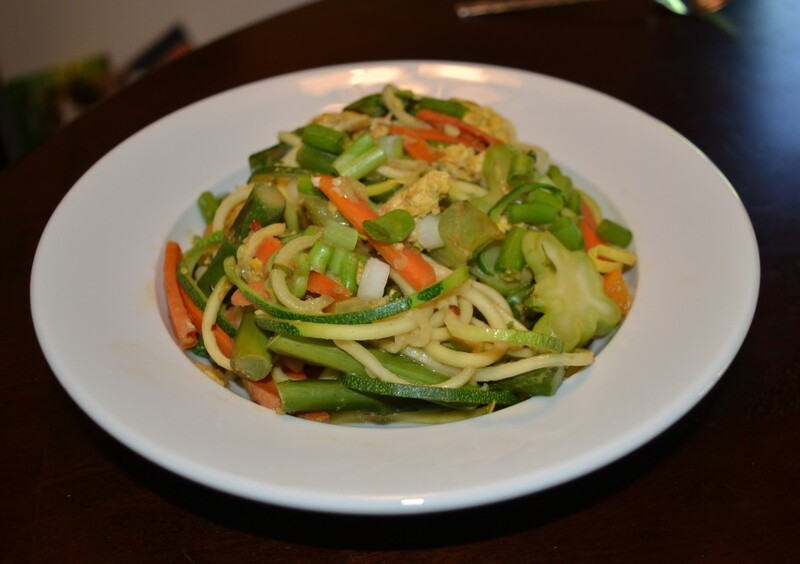 I bought a spiralizer a few months back, so I usually use it to make the noodles for this dish. 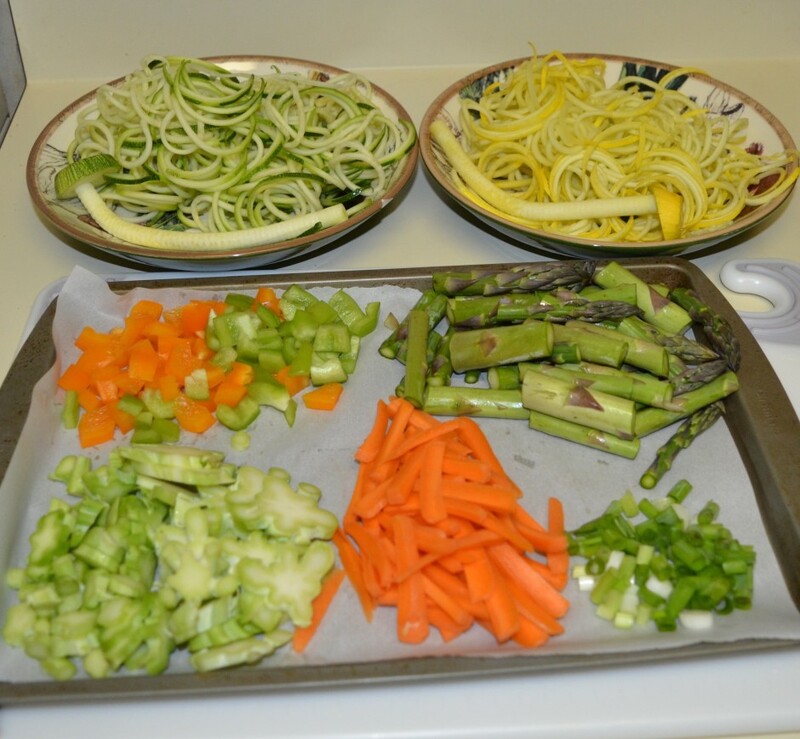 A spiralizer is a pretty inexpensive and fun tool. $30 can get you a quality version with three different attachments. There is something rewarding about so drastically changing the shape of a food, as you do when turning a zucchini into an incredibly long strand of ‘noodle’! If you don’t have a spiralizer or a desire to get one, you can use any ‘asian-style’ noodle you find in the store. As always, I recommend checking the ingredients on the package and pick one where all ingredients are words you recognize as real foods :). This time, I used bell peppers, carrots, asparagus, and a leftover stem from some broccoli I used earlier in the week. Keep in mind that you can use any vegetables you want in this dish! I like the color and shape variety I was able to make with this combination last night. Just check out how awesome the slices of broccoli stem look in the pictures above; way cool. I stir-fried the bell pepper, carrot and broccoli, and steamed the asparagus before adding it to the stir fry pan at the very end. I steamed the asparagus to lower the amount of oil needed for cooking, and because I like it cooked that way. You can simplify the step required by stir-frying it with the rest of the vegetables instead, but might need just a smidge more oil. If you do, the asparagus should go in the first step with the broccoli and carrots if you have room in your wok! If it is too much all together for all of the veggies to have some contact with the wok’s surface, cook in batches. 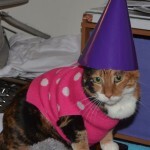 Without further ado, enjoy! 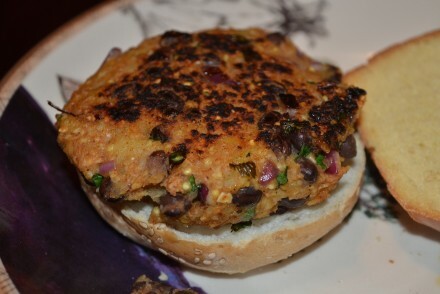 This is a light dish that is nice for summer. I will leave you feeling satisfied without being stuffed. 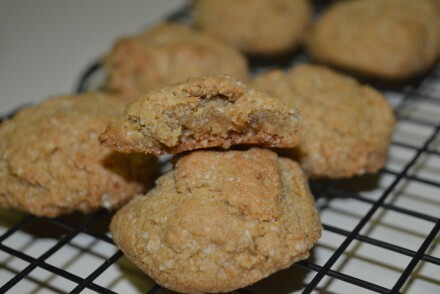 This recipe will make about 3 servings, so adjust the ingredients as desired. Get all of your veggies ready first! I had fun making different shapes with mine last night. I made matchstick cuts with the carrots, medium dice with the bell pepper, cut the asparagus into 3-4 pieces depending on length, and cut the broccoli stem width-wise to get that neat shape. 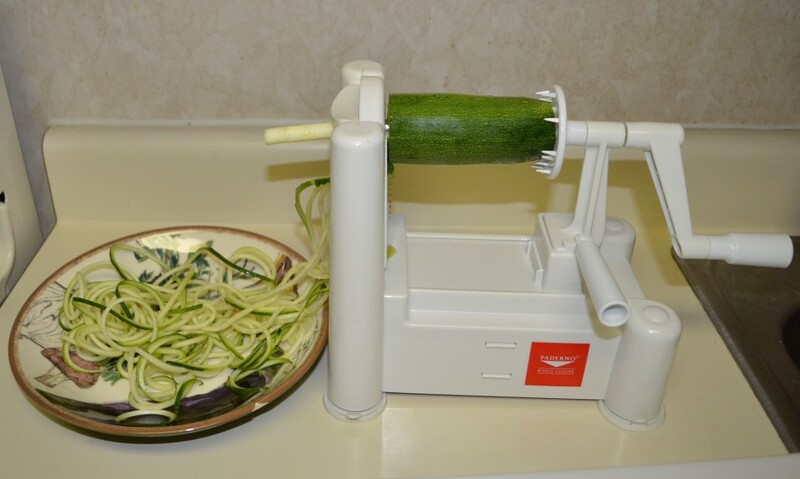 Spiralize your squash using the smallest setting (you can use zucchini or yellow squash, or one of each) and set aside. If you are using noodles, start to get the water boiling for that. 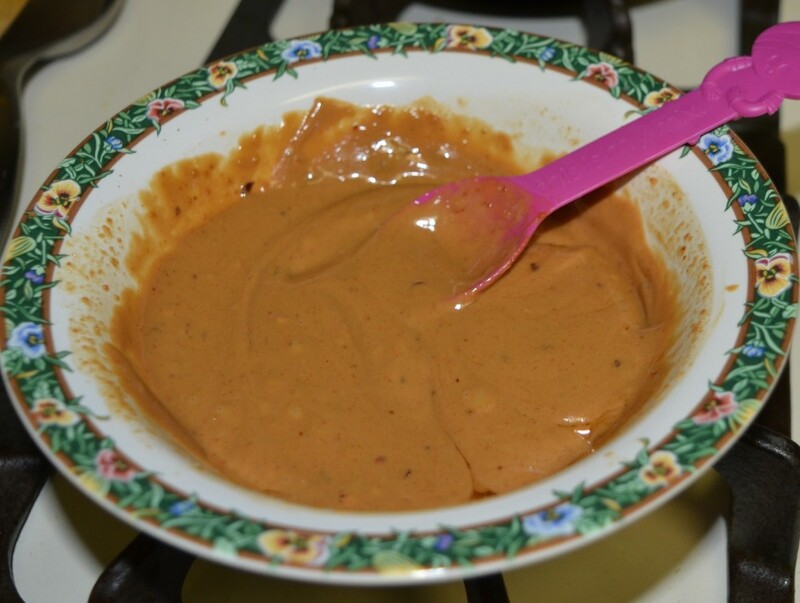 To make the sauce, place the 3 TBSP peanut butter, ginger, toasted sesame oil, sugar, red pepper flakes (optional) and ½ tablespoon of tamari (or regular soy sauce) in a bowl. Add 2-3 TBSP water and stire until the sauce reaches the desired consistency. You want the sauce to have a bit of a liquid feel, but still look pretty thick. When you add the sauce to the dish at the end, the heat will thin the sauce out considerably. It will look really weird for a while as your stir, but don’t fear! It just needs some time for the oil and water to mix. Taste the sauce and adjust as needed. You can add more tamari if you want more pungency, a bit more sugar to balance out the salt if the soy is strong, and more pepper flakes if you want it spicier. If steaming the asparagus like I did, get that started. Place a small amount of water in a pan that fits your steaming basket. 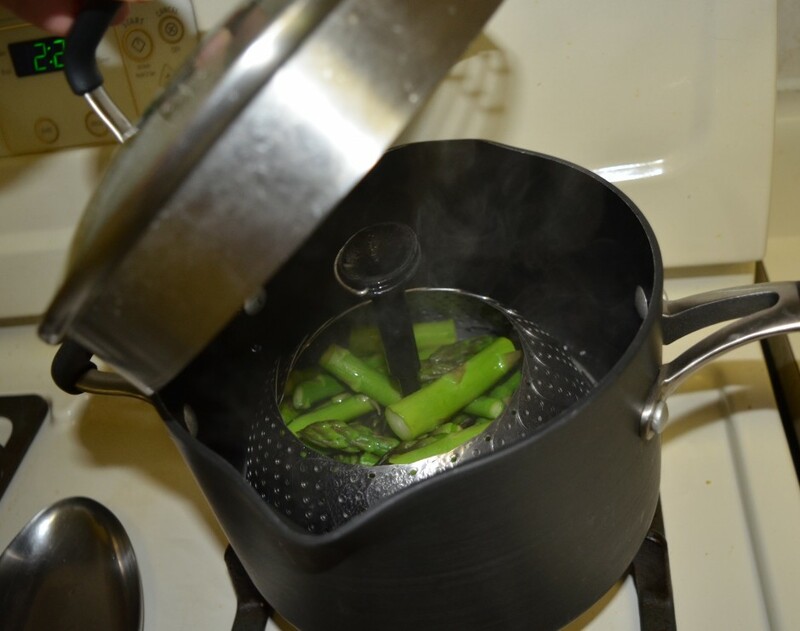 Once the water starts to simmer, add the steaming basket with your veggies and cover. Cook until fork pierces, but asparagus still has some crunch, about 5-7 minutes. At the same time, heat your wok over medium heat. Add 1 TBSP olive oil. 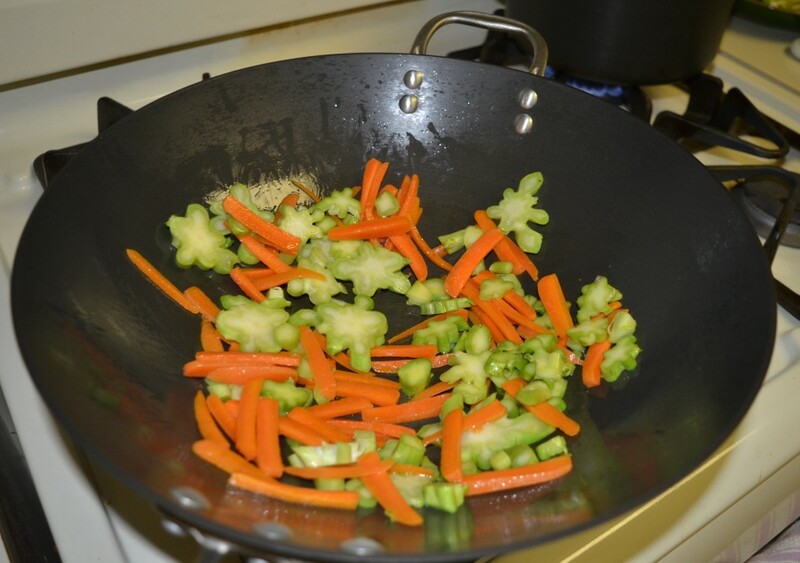 Once heated, add carrots and broccoli to the wok and cook for 4 minutes. Add bell pepper and cook an additional 3-4 minutes. Add in the steamed asparagus and cook another 1-2 minutes. Remove all the veggies to a plate to the side for a moment. Add JUST A TOUCH more oil and cook your eggs. Add the spiralized noodles (or regular noodles if using) to the hot wok and cook for 1-2 minutes until warmed. If you overcook, the noodles will lose all of their water and the nice crunch they have, so err on the side of caution. Add veggies back into the noodles and eggs and pour in the sauce. Mix well, top with sliced scallions and serve! You can also top with sesame seeds and a drizzle of sriracha if you like. If you try this out, let me know how it goes, and have fun experimenting!